Liudas Mažylis (born May 19th, 1954, Kaunas) – Lithuania’s scientist, professor at the Kaunas Vytautas Magnus University, political and public figure. Graduated the fifth high school of Kaunas in 1972; Vilnius University in 1977. Doctor of the Chemistry Sciences; Habilitated doctor in the sphere of management and administration (2007), professor at the Vytautas Magnus University. Hobbies – collector of the antique postcards, a fan of Kaunas basketball team “Žalgiris“. L. Mažylis was born in the famous pre-war Kaunas intellectuals’ family. Great–grandfather on mother’s side is Jonas Bliūdžius – book smuggler of Marijampolė region and public figure. His grandfather on father’s side – interwar Lithuania’s developer of the midwifery system Pranas Mažylis. Wife – Aldona, daughter – Liucija. 1977 – 1990 while working in the Institute of Cardiology, had published 15 articles in the reviewed periodical scientific publications about the synthesis of indole-class heterocyclic compounds and research, carried out a research of new biologically active compounds of this class; co-author of 6 inventions. Theme of dissertation: Synthesis and Features of Indolin-2 and benzindolin-2 on 3-modified compounds (1985). Since 1997 worked in Kaunas Vytautas Magnus University, Faculty of Political Studies and Diplomacy. Internship in Cambridge University (2002). Associate professor (2000), habilitation (management and administration in 2007), professor (2008). Published 20 articles in the reviewed periodical scientific publications on the themes of Europe Integration, Municipal Policy and Administration. March 29th 2017 found the original copy of the decision on the announcement of Lithuania’s Independency on February 16th in the diplomatic archive of German Ministry of Foreign Affairs. 1990-1995 deputy of Kaunas city council; 1990 – 1995 Chair of Mandates and Ethics Commission; 1990 – 1992 – member of Ecology Committee; 1992 – 1995 member of the Standing Committee on Municipal Affairs. Member of the Christian Democrats fraction. Candidate to the Seimas of the Republic of Lithuania in 1996 and in 2000; the member of Lithuanian Movement “Sąjūdis“ (1990-1992). Member of the Lithuanian Christian Democratic Party since 1995 (member of the Homeland Union – Lithuanian Christian Democrats Party since 2008); member of the party’s managing board in 1998 – 1999 and 2005 – 2006. Deputy of the chief editor in the daily newspaper Kauno Laikas in 1990-1993. Publications in Kauno aidas, Lietuvos aidas, Tevynės sargas, Apžvalga, Savivaldybių žinios, Veidas etc. Chamber of Commerce / The Central Building of the Physical Training Institute / Central Building of the Dairy centre / Central Building of the research laboratories / Church of Kybartai, Mažeikiai, Šakiai / Priest seminary of Vilkaviškis / Kaunas City Municipality / Surgery section of military hospital consisting of 700 places in Kaunas / Central dairy of Kaunas. Honorary citizen was granted on September 26, 1991. He was born in in Smalininkai village in Marijampolė region. A graduate of History from the Faculty of Humanities, as well as the Faculty of Law, he was also the Head of the Press Department of the Ministry of Interior and the editor of “Kriminalistikos žinynas” (“Criminal reference”). In 1940, he immigrated to Germany, and in Berlin University continued his studies of law. Between 1940 and 1949, he studied and lived in Denmark and Paris (at he Sorbonne University Faculty of law). In 1950, he returned to Berlin and participated in the activity of the unions for the liberation of Siauliai and Vilnius. He contributed to “Trimitas”, “Ūkininkas patarėjas”, “Lietuvos aidas”, “Amerika.” He also established, through his support and bequeathed art collection, the Mykolas Zilinskas Art Gallery – which opened in Kaunas in 1989. Honorary citizen was granted on September 26, 1991. A signatory of the Act of the Restoration of the Independent Statehood of Lithuania, and formerly Chairman of the Parliament of the Republic of Lithuania, and political leader of the Homeland Union (Lithuanian Conservative / Tėvynės Sąjunga). He is also a member of the Lithuanian Composers Union, the chairperson of M.K. Čiurlionis association and he honorary president of the Lithuanian Chess Federation and was Professor of the Lithuanian National conservatory for the years 1978 to 1990. 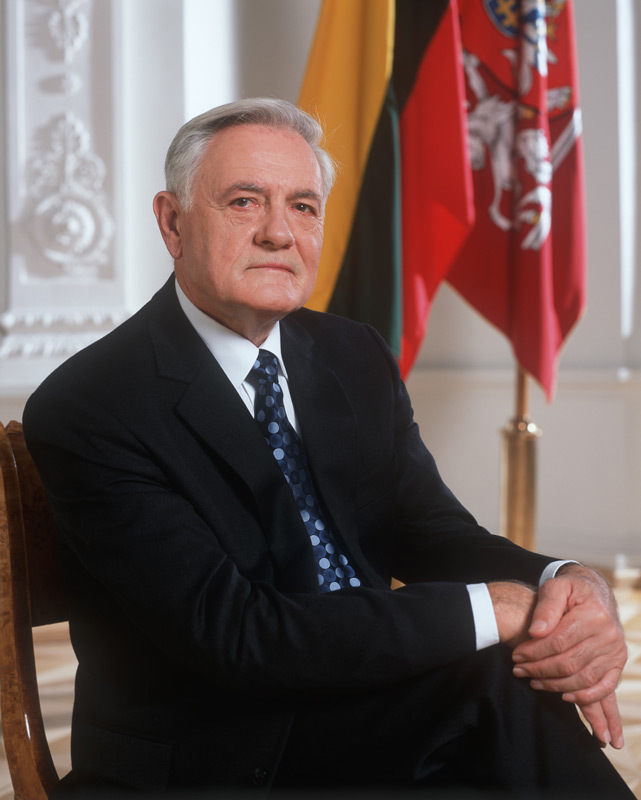 His political career took off when he was the leader of the Lithuanian delegation for negotiations with the Soviet Union and then chairman of Restoration parliament of the Supreme Council of the Republic of Lithuania (1990 – 1992) during which time he was also the head of the Commission for preparing the drafts of the Lithuanian constitution. His political activities continued as a Member of Parliament until 1996. A prolific writer and academic, he has had numerous books published on music, culture, history, politics, poetry, and a biography (in both Lithuanian and German languages). He is the honorary associate professor of Loyolod University (Chicago), Weber University (Odgen USA), Kaunas Vytautas Magnus University and Kaunas University of Technology. Honorary citizen was granted on January 27 1994. Born in Berlin, he graduated from the German high school in Rome before going on to study Law at Rome University as well as actively participating and promoting Italian-Lithuanian relations. Whilst in Italy he held several positions including member of the Union of the International Expatriates Clerisy Board, contributor to the publication „Santarve”, and editors assistant on the “The voice of Lithuania”. His diplomatic career started as part of the Lithuanian delegation in Washington in 1968. On October 2, 1991 he was assigned as Lithuanian Ambassador to the USA. In 1992, he returned to Lithuania and in February of 1993, he was an unsuccessful candidate for the Lithuanian Presidency. In December 1993, he was appointed as the Lithuanian Ambassador to Italy. Lozoraitis was buried in Putnam cemetery Connecticut State, USA but his body resumed and reburied here in Kaunas in 1999. Honorary citizen was granted posthumously on September 22, 1994. He was born in the village Gudoniai, in Alytus. In 1955 entered the Seminary in Kaunas but did not graduate and become a priest until 1962 having had to fulfil his Soviet army military service in between. However, the Soviet government disliked his principled and zealous activities in which they believed him to be encouraging youth to keep to Lithuanian traditions and calling people to resist the occupiers. His time as a priest was spent moving between Alytus, Lazdijai, Kudirkos Naumiestis, Prienai, and Vilkaviškis due to constant persecution. In 1972, having received the assent and blessing of Vincentas Sladkevičius, he started to secretly publish articles (“The Chronicle of Catholic Church in Lithuania”). The publication continued traditions inherited from book-carriers of the former century as well as the traditions of spiritual and peaceful resistance. In 1978, both he and others priests founded the Catholic committee to protect the believers’ rights. On May 6, 1983, he was arrested and on December 2, the same year, he was convicted to 6 years for strictly regime and exile for 3 years. Honorary citizen was granted on September 22, 1994. Born in Stebeikeliai village in Biržai. The early part of his childhood he lived in the USA and returned to Lithuania in 1914 where he later graduated in Humanities from the University of Vytautas Magnus. His first poem which he posted in the youth journal, was called “Spring” (“Pavasaris”). However, he continued to write and involve himself prolifically starting in 1926 with a published collection of poems called “White Days “and following this with the poem “The Crying Slave” and the anthology of young poets “The First Decade”. His University life and the period after this saw him continue with his writing poetry and editing poetry anthologies including “Eternal Jewish”, the student newspaper “Lithuanian student”, “Rays of Future”, “Windrow”, “Meridian”, “Lithuanian’s chronicle”, and in 1947 the chronicle of Lithuanian poets “The Years of Emigration”. His professional life included spells at the publishing house “Sakalas” (“Hawk”) and Director of the Maironis Literature museum. In 1944, he once again left Lithuania to live briefly in Ravensburg, Germany and then in 1949, he went to Boston in the USA to work as a coordinator of the Universal Literature Department of “Lithuania encyclopaedia”. The poetry of Bernardas Brazdžionis is truly original and has its grounding in Lithuanian tradition. The amplitude of his creation varies from romantic stardust to realism, from point of soft lyric to grotesque, from soft orison to redoubtable menace. According to poetic opinion, he is among the great poets of Lithuania. His literature created for children is above the level of only special literature. He lived for many years in Los Angeles, in the USA. Honorary citizen was granted on September 21, 1995. Born in Išlandžiai village, Marijampoles region, he studied here and in Vilnius and at Kaunas University at the Faculty of Humanities. His early career saw him working as a teacher and as a secretary in the Ministry of Foreign Affairs. In 1928, he started translating fiction and in 1937/1938 he delivered a course on the Lithuanian language in Naples Oriental Institute. Upon his return to Lithuania, he continued working as a teacher in Kaunas “Aušros” boys high school and Kedainiai high school. In 1942 – 1944, he was an editor of Kaunas national publishing. His nationalistic and anti-occupation activities saw him imprisoned in NKVD Kaunas department under the Soviet regime and in 1950, he was sentenced to twenty five years in a prison camp with the confiscation of all his property. However, he only served five years and returned to Kaunas where he worked on translating works of world-famous writers into Lithuanian language: L. Tolstoy, A. Chekhov, V. Hugo, A. Franso, B. Celiny, L. Pirandel, G. Bokacco and others. His recognition came through this work and he received numerous awards for his achievements – including the Cavalier of the Third degree of Gediminas Order – as well as being the oldest member of the Lithuanian Writers and Journalist Union. Honorary citizen was granted on May 18, 2000. Born in Kaironys village, Pagiriai Region, he graduated from Kedainiai high-school and then studied at Kaunas Vytautas Magnus University Faculty of Chemistry. In 1940, during the Russian occupation, he joined the resistant movements Sąjūdis and Antinazist, In 1943, he was elected on to the Board of the Union of Young Lithuanian Catholics – an underground organisation dedicated to publishing information in Lithuanian for freedom fighters and activists – and in 1944, with help from colleagues he established the Council of Lithuania Liberation becoming its chairman. A year later he was arrested and sentenced to death – although this was later changed to a ten-year sentence in prison – and returned to Kaunas in 1955. His post war career saw him produce and publish over fifty works, twenty-one of them were inventions. In February 1987, after three and a half years in prison for criticism of the constitution and memorial writing he wrote and published his memoirs along with other books on political topics. His prolific output included: two volumes of “Gyvenimo akimirkos” (Moments of life) – 1990; “Žvilgsnis į dabartį” (Look at the present) – 1992; “Politinių aistrų sukury” (In the whirl of politics) – 1994; “Spingsule tamsaus tunelio gale” (Light at the end of the tunnel) – 1995; “Baravykų raistas” (Valley of mushrooms) – 1997: “Praeities aidai” (Echoes of the Past), “Svetimų nepalaužtas, savų nepaklupdytas” (Not crushed by the enemies, not prostrated by friends – 1999). He also contributed a lot of articles to the local and national press, was one of the publishers of the magazine “Naujoji Romuva”. And was nationally recognised by the award of GDL Gediminas medal of the 4th rank. He will be remembered for many things least of all his time spent as a resistance fighter and ex-political prisoner, writer and publicist, doctor of technical sciences, and the chairman of “Atmintis” (Memory) – the Society of Residential Heritage.Honorary citizen of Kaunas City on May 18, 2000. He studied in Kaunas and in 1953, he entered Kaunas Seminary and upon being ordained worked with communities in Tauragė, Eržvilkis, Kelmė, Panevėžiukas amongst others. Since 1989, he was working as a priest in Kaunas Vytautas Magnus and St. Mykolas Archangel’s churches, Aleksotas Chapel. He taught philosophy in Kaunas Medical University and was chaplain at the Lithuanian academy of agriculture. In Kaunas City Hall in 1989, he presented his first volume of poems: “Kad Lietuva neišsivaikščiotų”, followed by a collection of poems “Šviesos spalvos”. In 1994, he was elected member of the board of the Union of Lithuanian Writers. In total, he published 6 books and an extract from the sermon “Prisikėlimas” (Ressurection) and was awarded many prizes for his work including being twice elected the most popular person in Kaunas City. (1993 and 1996), and the award of third rank order of Great Duke Gediminas. He died as a victim of violence in the city and was granted honorary citizen posthumously on November 30, 2000. Born in Žadžiūnai – Kalniškiai village, Šiauliai region, he is one of Lithuania’s most famous writers and cultural figures of the second part of the 20th century. His early life included education at Šiauliai high school, and Vytautas Magnus University Faculty of Theology and Philosophy. In 1928-1939, he worked as editor of “Mūsų laikraštis” (Our Newspaper) and delivered a course of Lithuanian history and Lithuanian language for Jewish TARBOT. In 1937 – 1938, he was the president of Lithuanian Writers Association. In 1940 – 1949, he was the editor responsible for national fiction publishing. In 1989, at his house in Žaliakalnis area of Kaunas the Memorial museum of Juozas Gru?as was established (part of the Maironis Lithuanian literature museum). He is recognised as being a writer who, through his prose, dramaturgy and Lithuanian literature, raised national self-awareness, encouraged national revival, spread sensitivity and tolerance. Grušas was one of the writers association establishment initiators and worked as its board member for a many of years. Honorary citizen of Kaunas City was granted on October 25, 2001 (posthumously). Vladas Garastas - Basketball Coach (including time as Žalgiris Coach). Born in Linkuva, Pakruojis region and graduated from Biržai high school, and later the National Physical training institute of Lithuania. After a spell as Biržai region’s national team coach, he took over as senior coach of “Žalgiris” basketball men team from 1979 to 1989. His success with the Žalgiris team was phenomenal: Soviet Union championship silver medals – 1980; participation in the European Cup for the first time – 1981;Champions of the 50th Soviet Union championship – 1983; Silver in the Soviet Union Championship – 1984 and Gold in 1985; In the tournament of R.V. Johns Cup of the Championship of the World’s Best Club Teams, “Žalgiris” became the champions of the world’s best club teams. Such results were unprecedented at this time for Soviet basketball teams, and results owe a lot to the class and quality of the players we had: Valdemaras Chomičius, Sergejus Jovai?a, Arvydas Sabonis, Rimas Kurtinaitis, Algirdas Linkevičius. He was rewarded with the position as Head Coach to the National Lithaunian team coach going on to win with them the bronze medals in Olympics games in Barcelona in 1992, and in Atlanta in 1996. He was granted the sign of Honour for merits in Olympic movement, as well as for merits in Lithuanian sport by the Government of the Republic of Lithuania, and he was also awarded orders of the first and thirds ranks of the Great Duke of Lithuanian Gediminas. Honorary citizen of Kaunas City was granted on January 24, 2002. Born in Kaunas but a graduate from LVK Faculty of Theatrical Art in Klaipėda, he also served two-years in the Soviet Army during the conflict in Afghanistan. This in part led him to become a leading community organiser and activist spending time as Head of the Utena Knitwear Factory club, a folk dance group, and Chairperson of the Union of Afghanistan Veterans. Between 1992 and 1995 he had a creative and successful spell as Director of Lithuanian Television, Kaunas Direction Programme “Svetimo skausmo nebuna”. His other business interests saw him as Manager of the company “Logika ir azartas” and later as Manager at the company “Gedimex”. In his short political life. Ruzas was a member of Kaunas City Council (Social Democrat Party) since 1997; and in 2000 he was elected as a member of Seimas with a position on the Committee of National Security and Defence. He died on October 7th, 2002, after serious injuries in a car accident near Rumšiškes. Honorary Citizen of Kaunas was granted on February 20, 2003. In the years 1973-1977, Aleksander Kwasniewski read for transport economics (foreign trade) at the Gdansk University. An activist of the student movement up to 1982, having held, among other functions, chairmanship of the University Council of the Socialist Union of Polish Students (SZSP) from 1976 to 1977, vice-chairmanship of the Gdansk Voivodship Union from 1977 to 1979. A member of the SZSP supreme authorities from 1977 to 1982. From November 1981 to February 1984 – editor in chief of student weekly “ITD,” next editor in chief of daily “Sztandar Mlodych” from 1984 to 1985. A co-founder of the first computer-science periodical in Poland “Bajtek” in 1985. From 1985 to 1987, Minister for Youth Affairs in the Zbigniew Messner government, and then Chairman of the Committee for Youth and Physical Culture till June 1990. A member of the Mieczyslaw Rakowski government, then a cabinet minister and Chairman of the government Social-Political Committee from October 1988 to September 1989. A participant at the Round-Table negotiations, co-chairing with Tadeusz Mazowiecki and Romuald Sosnowski the task group for trade union pluralism. A member of the Polish United Workers’ Party from 1977 to 1990. A co-founding member of the Social Democratic Party of the Republic of Poland from January to February 1990, and its first chairman till December 1995. One of the founding members of the Democratic Left Alliance in 1991. A sports activist in the Student Sports Union from 1975 to 1979 and the Polish Olympic Committee (PKOL). PKOL president from 1988 to 1991. Distinguished with the Golden Olympic Order of the International Olympic Committee in 1998 and the Golden Order of Merit of the International Amateur Athletic Federation in 1999, and in 2000 Order of Merit EOC (European Olympic Committee). Aleksander Kwasniewski won the presidential elections for the first time in 1995 on the election campaign slogans: “Let’s choose the future” and “Common Poland,” collecting 51.7 percent of votes, against 48.3 percent cast on Lech Walesa. In a year 2000 he won again collecting 53,9% of votes in the first run. His election campaign slogan was: “The home of all – Poland”. Sworn into office on December 23rd, 1995, as President of the Republic of Poland. On the same day, President Kwasniewski took an oath as Superior of the Armed Forces at the First Fighter Wing, “Warszawa”, in Minsk Mazowiecki. On December 23rd, 2000 he took his office for the second term. A co-author of the Constitution draft and a mover of the referendum campaign in favour of passing the Constitution of the Third Republic of Poland, which he signed into law on July 16th, 1997. In 1996, President Kwasniewski submitted the draft of a convention on fighting organised crime to the UN. Took an active part in the efforts to see Poland in NATO. Head of Poland’s delegation at the Madrid and Washington summits in 1997 and 1999 respectively. On February 26th, 1999, he signed the instruments ratifying Poland’s membership of NATO (during a joint ceremony with the President of the Czech Republic, Vaclav Havel). He also took active part in further enlargement of an Alliance supporting invitation for seven new states (NATO Summit 2002 in Prague) and the ‘open door’ policy. Following the September 11th 2001 events upon his initiative and within antiterrorist coalition there was an international conference organized in Warsaw with participation of leaders from Central, Eastern and South-Eastern Europe to strengthen regional activities in combating international terrorism. An advocate of regional cooperation in Central and Eastern Europe. Host of the meeting of the Presidents from the region at Lancut in 1996. An active participant at such meetings in Portoroz in 1997, Levoczy in 1998, Lvov in 1999. Jointly with Lithuania’s President, the driving force behind the meeting “Coexistence of Nations and Good-Neighbourly Relations: the Guarantee of Security and Stability in Europe,” held in Vilnius in 1997 and the follow-up conference “Baltic-Black Sea Cooperation: Towards the Integrated Europe of the 21st Century Free of Dividing Lines,” held in Yalta in 1999. Author of the ‘Riga Initiative’ (2002) – a forum for cooperation of Central Europe states towards further enlargement of NATO and the European Union.